When did thick lose it's "K" and become "thicc?" Social media dog communities like Dogspotting seemed to have gained their own language when it comes to pups. Some of it is fun (I LIKE saying doggo! ), and some of it is worrisome. Because when I see someone posting about an adorbs "thicc" pup, especially a beagle, it's meant as a term of endearment. There are whole Facebook groups where people post pics of "Thicc" pups. 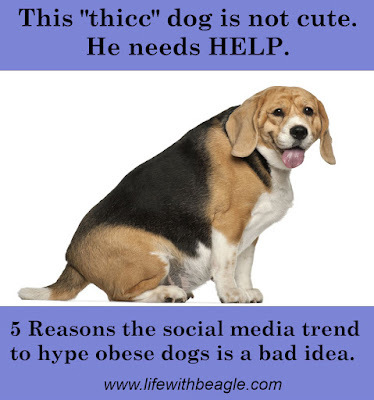 I'm here to tell you that, for the most part, a "thicc" beagle is not a cute beagle. 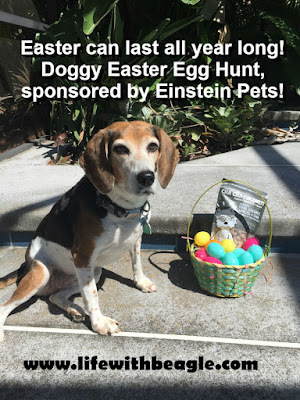 It's a beagle with a serious health problem, and we should treat it as such. Jasmine rarely lets me see her play. I'll often catch her running with a toy in her mouth, and then when she sees me she puts it down and looks away, like it never happened. Which is preferable to the other thing she will do with her toys, which is guard them at random moments. And woe to the person who gets close to them. So this means I almost never see Jasmine play. But I know she does, because I find her toys all over my room when I come home from work. And they are definitely hers. Today, this is where I found her Albert Einstein -- face down on my pillow. And when I called Jazzy over to take the picture, she acted like she'd never seen it in her life! TELL US BELOW: What do you think Jasmine and Einstein were up to while I was gone? What strange places do you find your dogs' toys? Hope you had a great Easter holiday! Did you do an Easter Egg Hunt? Well don't put those eggs away yet! We have a great activity that will help you get Easter going all year long, sponsored by Einstein Pets. 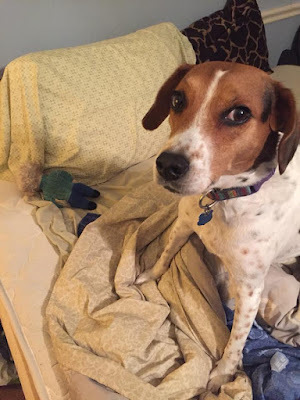 DISCLOSURE: Life With Beagle did not receive compensation for this post, and all thoughts are my own. How do you get the dog hair off your furniture? I've got this red, microfiber couch, that Lulu and especially Jasmine love to sit on -- especially on the top of the couch. Jasmine on the couch, like a furry vulture. But that means a lot of pet hair... on the cushions, between the cushions, under the cushions. Normally I use a lint roller to get the fur off -- but I end up needing a dozen lint sheets to do the couch justice. 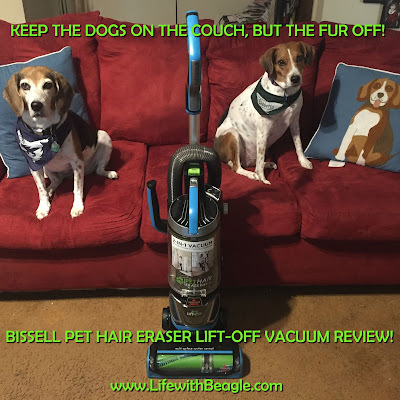 But this new Bissell Pet Hair Eraser Lift-Off vacuum is a powerful time -- and couch -- saver. DISCLOSURE: I received a free vacuum from Bissell to do the review. I received no other compensation, and all opinions are my own. Lulu and Jasmine love jerky treats! Especially from Spot Farms and Full Moon! We reviewed their new Duck Training Treats back in December. We have another review coming up soon! But, good jerky treats can be pricey. And you always have to watch out for less than reputable companies too. So this weekend I attempted to make my first ever batch of treats. The dogs seem to like them -- maybe your dogs will too! 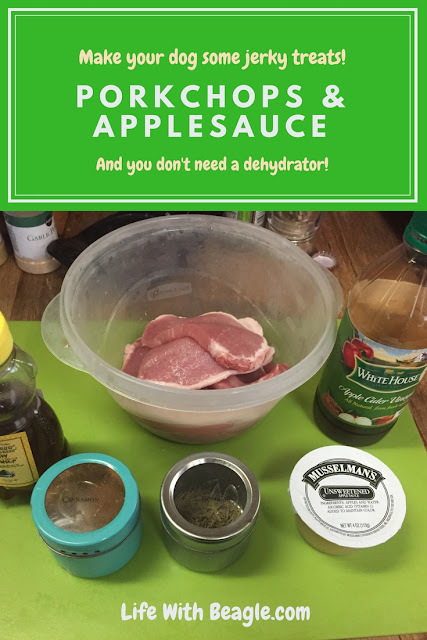 So here are my Porkchops and Applesauce Jerky Treats, using a modified recipe from Kol's Notes. "Uhhh... Lulu? Can I have my pillow please?" Lulu steals my pillows. She did just last night. Jasmine steals my blankets. I have a king-sized blanket on my bed just for her now, I'll probably never be able to get it back. I'm lucky I have a bed, I guess. Do you share your bed with your pets? How do you make it work. Tell us in the comments below. And hey! Have you joined our new Facebook groups yet? Be sure to join up so we can talk about our dogs together!